If you would like more information or would like to request a training session/s, please click here. Tactical Classroom Ltd was founded in 2017 by Jeremy Geurtjens, an Active Service Police Officer with a Counter Terrorism and High Threat Tactical Policing background. A few months earlier (late 2016) he was delivering a Precision Rifle Class to a group of Part-Time Tactical Officers. throughout the year…not just once every 12 to 24 months. As a result, Jeremy felt the NEED to ensure that quality firearms training was available 24/7 for those that needed it and who couldn’t attend LIVE training sessions. That’s when it occurred to Jeremy…what about leveraging the power of the Internet? The idea expanded to include ALL folks with a passion for firearms and who had a desire to become more proficient in their use…not just Military and Law Enforcement personnel. 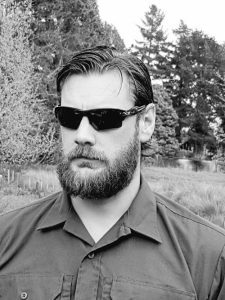 My name is Jeremy and I am the Owner and Founder of Tactical Classroom Ltd.
My background is Tactical Law Enforcement…specifically Counter Terrorism and other High Risk Tactical Policing but I will not be drawn into specifics. I’ll use an analogy to explain my reason/s for not doing so. In professional sport, a “great player” rarely goes on to become a “great coach” later in their career. I believe this principle also applies to Firearms Coaching. Just because a person has the required “skill set” and is capable of performing at the highest levels of Military, Law Enforcement, or Competition, it doesn’t mean that they are the best person to teach those skills. So basically, I believe that the Adult Learning and Education courses that I have completed over the years are the most important skills that I have. Those Adult Learning & Education courses taught me not only how students learn new skills BUT ALSO, what it takes to teach those skills properly. The fact that have a background in Tactical Law Enforcement, am a qualified Firearms Instructor, and that I continue to shoot in Competition is simply a bonus. When I’m not working, I enjoy hunting with my friends and spending quality time with my family.